On Tuesdays we have Kimono dress day at the dojo. We practice taihai in Kimonos, at least those with the rank. Sandan and above. I went today it was a good day. I usually always learn something some small detail I had skipped before or I not know. Even if I am not shooting well my TaiHai is improving, by the time I test again I will at least have that part pretty down. Besides the learning it is a good time to connect with my dojo mates. We split into groups, one group shoots the others watches and tells what they notice in error afterwards. Everyone gets a chance at speaking. That is it self is a learning experience. It is usually a challenge for me to understand what I am being corrected on, but it works out, surprisingly. Sometimes it takes a bit of extra effort for someone to explain. Sometimes I do not get the words, so it is shown what I am doing in error. Actually most times I do not get the words, but I catch a few and along with some motions I figure out what it being said. In the down time or breaks in between there is other talk. Today a couple of ladies and I worked out who is age wise older, senpai and when our birthdays are. Nothing to do with anything just chatting. 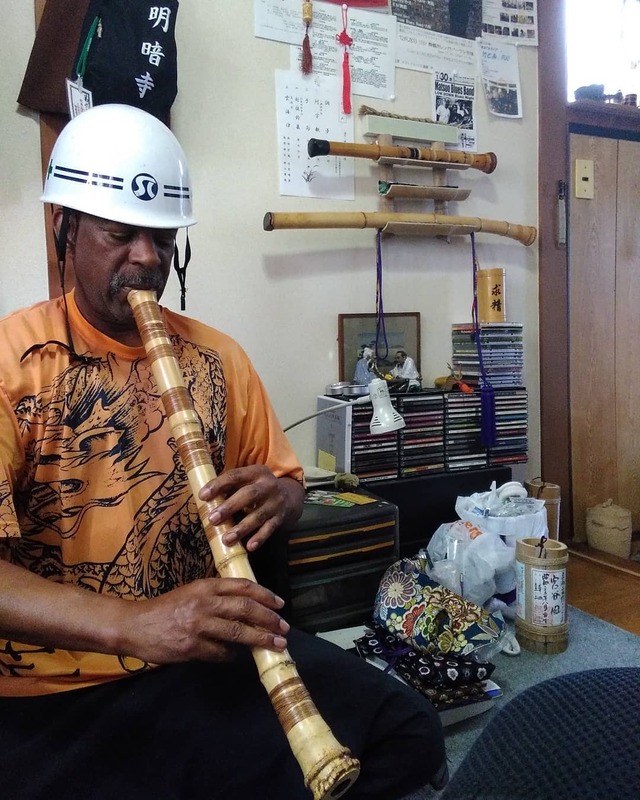 Another topic today was earthquakes since I showed them a picture of me practicing Shakuhachi yesterday with a helmet on as a Face book picture joke. and what is the English word for it. It was cute hearing them try to say it. They would say earthquick. No no I said, and wrote it down. Quake Like cake not quick. We laughed at it all but they got it in the end. 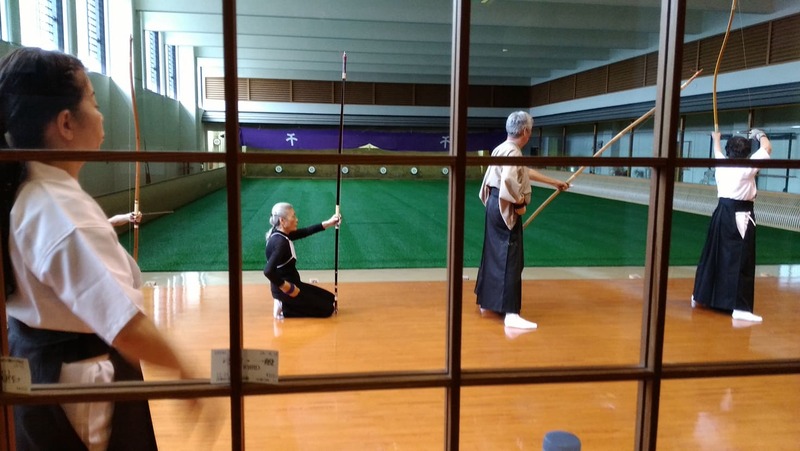 Yesterday I went to Kyudo practice. I had planned on doing some Komuso practice afterwards, but that did not work out. Which I wrote about on the Komuso blog. 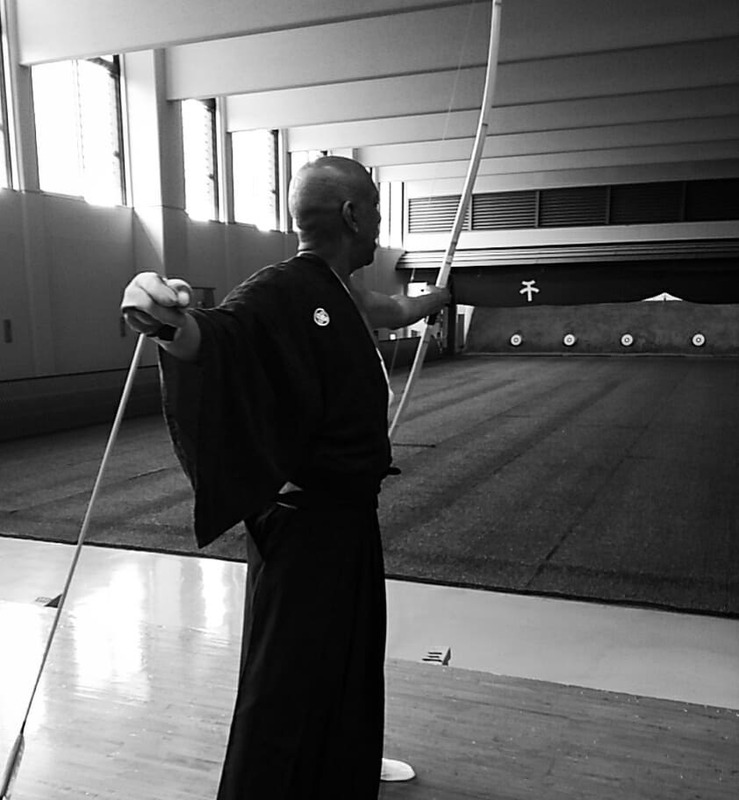 As for Kyudo, I have been working more t home with the Makiwara to cement things into my “bones” . I had a revelation last week at the Kimono class about my shooting. Actually my stance not my shooting, if I was to knit pick. Posture, jumongi. I was noticing I was not turning fully perpendicular to the mato, with my upper body. I did not have a chance to fully test the thought, but I did have a chance yesterday. I had originally planned for a two-hour practice, then go out for my Buddhist Komuso practice, but I cut it down to an hour o as not to tart too late. Which tuned out to be pointless. So yeah, I got in some practice , it did make a difference. I got on the first shot, and just missed on the second. I still need some adjustment and other work , because I missed a lot after that. I think I slacked off on other points. Because towards the end when I really focus on every detail I improved. The Kaicho gave me a quick check over on his way out , on my last shot. It hit he said I need to keep my head back more and raise my chest. Other wise good. The week before at Kimono practice. I was corrected on some Tai Hai points. Not lifting heels off the floor when walking backward to Honza from Shai, placing my Yumi on the outside on my knee cap not the inside, leaning the yumi slightly outward when turning out of the Kimono disrobe part. “Hadanugi “. Plus some other small points, nothing to do with shooting but having to do with proper form. So still getting bit by bit instructions. Taking them in, logging, implementing, the process continues. When starting back to for the summer, I should be able to return to going to the dojo twice a week now, without hearing static from the minister of finance. 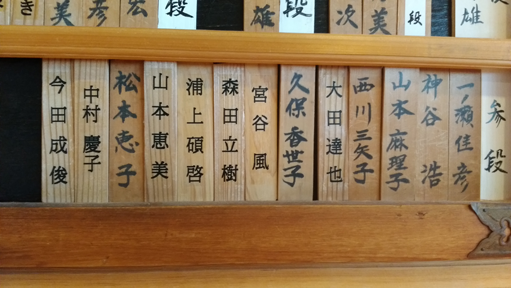 I am pretty certain I will attend the next Shinsa in September at my home dojo. Feeling ready or not, taking it as part of practice. Like one is supposed to approach doing meditation, the goal is doing it, not the result.